External sensors such as Wideband Air Fuel ratio, Boost or Fuel pressure will require additional hardware depending on year model vehicle and how many external signals you wish to monitor and/or be included in the TwEECer log files. The Ford EEC/PCM is not capable of accessing these external signals directly, but when included in your log files, you can quickly see where a lean condition is and needs to be corrected. On many EEC-IV based vehicles the EGR Valve Position (EVP) sensor can be used as an analog input, to measure a 0-5volt signal, much the same manner as a Digital Volt Meter (DVM). The output signal of many add on sensors will be scaled 0-1volt or 0-5volts. 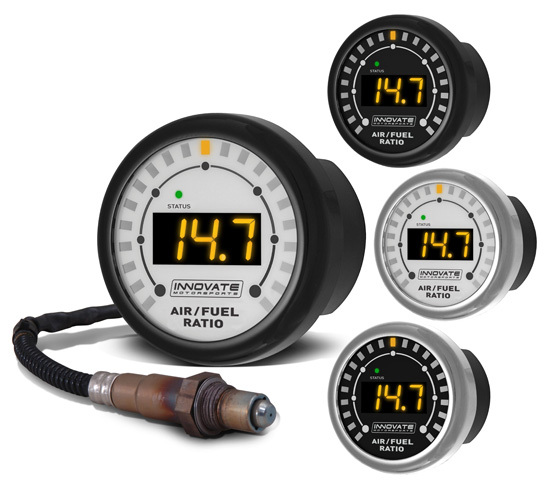 This includes most Wideband Controllers used to accurately measure Air/Fuel ratios. EEC-V vehicles do not have this specific extra input available. The Original Equipment Manufacturer (OEM) Narrow band HEGO (Heated Exhaust Gas Oxygen) sensor used by Ford, can measure Air/Fuel accurately only at stoichiometric or 14.7:1. Outside of that, the accuracy falls off very quickly, while being able to report rich or lean, they cannot measure how rich or lean. Many wideband controllers measure Air/Fuel Ratios of 10:1 to 20:1, with some reading a wider range and others a narrower range. When tuning a super or turbo charged setup, a wideband is required, if you want to keep the engine together. DATAQ makes two external Analogue to Digital (A/D) converters that are supported by our CalCon software and available for VERY reasonable costs. 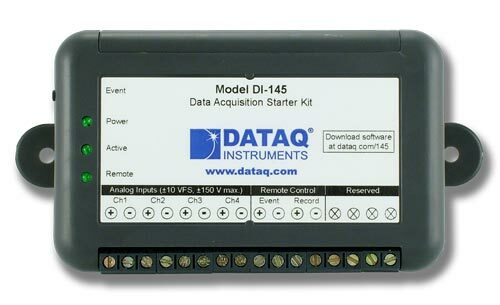 The DataQ DI-145 gives the end user 4 external channels to log additional sensors. 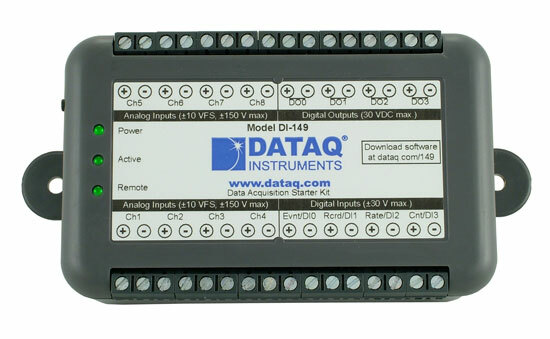 The DataQ DI-149 gives the end user 8 external channels to log additional sensors and uses USB as its connection to your PC. Using either unit will require at least two (2) USB ports be available, one for the TwEECer and one for the DATAQ unit. We highly recommend wideband controllers from Innovate Motorsports and PLX Devices line of products. Both companies are VERY reputable and stand behind their products. We have heard nothing but good things from our customers who have been using these wideband controllers. We have been using a unit from each of these companies for more than 10yrs now and have been 100% satisfied with each. The LC-1 is a complete wideband Air/Fuel Ratio sensor & controller built into a sealed cable. The MTX-L is Innovate Motorsports latest offering for the enthusiast, but with the additional benefit of having all of the electronics sealed into the included display Gauge. 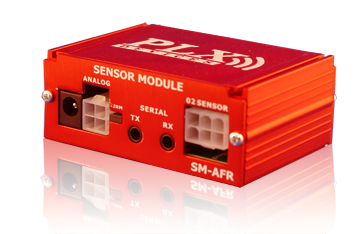 The PLX Air Fuel Ratio Sensor Module accurately measures the precise wideband air fuel ratio (AFR) of any internal combustion engine.